Club Aquarius is an International Dive Club made up of SSI – Scuba Schools International divers. It is for the avid diver who wants to enjoy many benefits such as special events, free pool use, discounts on scuba dive trips and more! Scuba Professionals of Arizona’s Club Aquarius is a chapter of this globally recognized dive club. Unlimited number of 1-hr pool sessions in our heated indoor pool. Tanks and weights included. Exclusive invitations and first access to Members Only events. 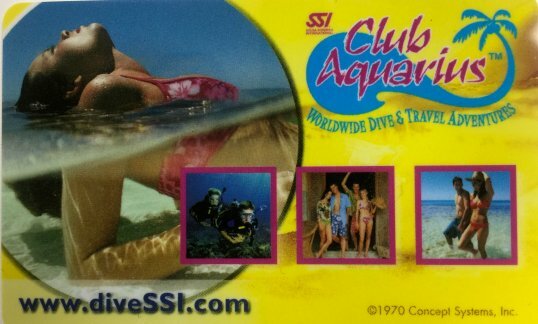 Exclusive Club Aquarius Membership Card. Monthly Club meetings to keep you connected to the diving community and a great opportunity to make new friends and dive buddies! *All the offers and discounts are available for bookings and purchases made on or after January 28, 2015. This is a great way to keep diving, be at the front of the line for gear demos, meet new dive buddies and commit to that epic adventure you’ve been holding off on for too many years. Come by the shop or give us a call 602-314-6650 for more information! Annual membership is only $100 per person, $190 per couple or $270 for a family of 3 or more!